As straightforward as it seems, stamped concrete is concrete that is poured and stamped with a pattern while it’s still damp. The concrete can be stamped and colored with a custom pattern or imitate products like pavers, stone and even wood. Technically, all surfaces can become slippery when wet and caution should be used especially with children, the elderly or the clumsy. To help with accidents, stamped concrete can have skid-resistant additives like “Shark Grip” mixed with the sealer. Of course this is no guarantee against little Jimmy face planting while running on wet stamped concrete, but ask your contractor about steps they can take BEFORE the concrete is cured and dried. Is stamped concrete more prone to cracking than regular concrete? You might think because of the pattern, that the concrete is weakened. Since the concrete is commercial-grade and rated at a minimum of 3,500 PSI, the answer is: No. Good installations use fiber reinforcement, as well as internal steel wire mesh to add incredible strength. As with any concrete installation, there is no guarantee against any cracks, though random structural cracks are much less likely to occur when properly installed. That depends. “Expensive” means different things to different people. That said, the price of stamped concrete – which ranges between $13 and $14/per square foot – is generally less expensive than pavers or natural stone installations. Sounds like I can do this myself. Nope. Even for the most skilled DIY-er, this is a project best left to the experts. Stamped concrete requires special tools, skilled installers and specialized manpower. Just because it’s easier on the pocketbook, doesn’t mean it’s easier on labor! For an average sized backyard patio, approximately 500 square feet, can be completed start to finish in 2-3 days. Depending on temperature and weather conditions, the patio will be ready for general use within 24-48 hours afterwards. In the end, your patio choice is a personal one, though there’s no reason to be intimidated. 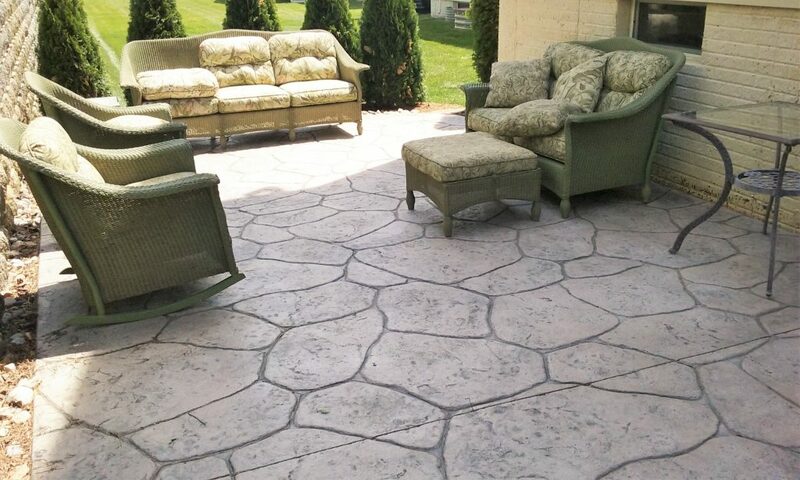 Stamped concrete is an economical and attractive option for your patio with many different colors, patterns and textures to consider. Take your time – ask questions – and amaze your family and friends!